One task that some parents find it difficult to actually get a hold of would be to feed their kids during meal times, or rather, to have their kids finish up their meals willingly and voluntarily. Well, perhaps there are other ways to make such a thing happen, and with the $18.99 Dinner Winner Plate, we might have a winner here. 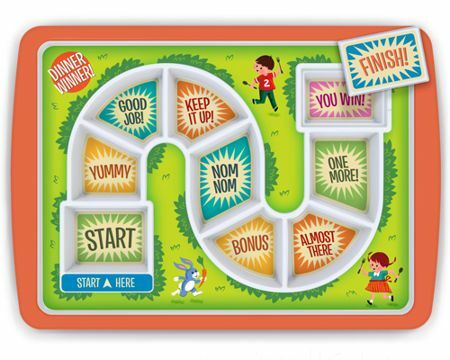 The Dinner Winner Plate comes in a bright and colorful form factor that ought to be able to capture the imagination of the masses, being specially designed to look like a board game. That alone ought to have little ones go racing to the dinner table, unless they are engrossed in some sort of game or another. The whole idea of the Dinner Winner Plate is to arrive at the finish line, where there, a special hidden treat will be revealed, after getting past Mashed Potato Mountain, Broccoli Forest, and the Valley of Brussels Sprouts.